No matter how large or small your next digging project, we have everything you need. To learn more about how to make digging easy and enjoyable follow these tips on what equipment and tools to use. Before starting any digging project be sure to call 811 or the local or government utility location service to learn about what may be underneath the surface. Even if it’s a digging project as easy as installing a mailbox, always call. It’s better to be safe than sorry when a line or pipe becomes damaged and cost you lots of money. Many homeowners often take on digging projects to excavate a trench or build a garden. Here you’ll learn no job is too big or too small, we have all the tools you need. 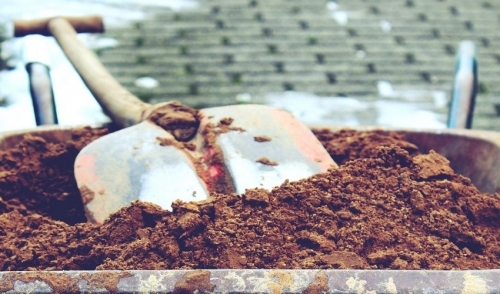 Once you know what’s underneath, you can plan your excavation. Every project needs a plan so that you can take the time to choose route and depth you will dig, and determining the tools, equipment, and material you will need to finish your project. Depending on the type of trench or garden you are trying to complete, you will need a variety of tools and equipment. Whatever the job is, make sure to match the tool to the job. For starters, you need a nice round point shovel. This will serve you well as you cut into dense or rich topsoil. Square points are more suited for loose materials like gravel or dirt. Keep in mind every project requires more than one piece of equipment. You’re going to need combination of tools to for your next digging project. Once you start getting past the first foot of you hole or trench, consider switching to equipment that is more specialized to help you finish your task like trenching shovels and hoes. Trenching shovels are really good clean-out shovels. They save you time and energy because their design allows you to scoop loose soil out of the bottom of a narrow trench. These should not be used to dig deeper as the shovel is too narrow to be pushed deep into the ground. To dig a deeper hole consider using a digging bar, pickaxe, or trenching hoe. These types of tools allow you to break up tough soil deeply compacted within the ground. A trenching hoe, also known as a grub hoe is more efficient and better suited for digging deeper trenches and controlling the route of your digging. For the bigger digging projects consider renting power equipment. A small bobcat or a power trencher can save you a lot of time and energy. It may sound expensive, but daily rates are extremely affordable. For small around the house projects, there are always a variety of garden tools one can choose from. When your project is finally completed, always remember to clean your tools. Cutting blades and shovels that are clogged with clay can create a lot of friction, which will make the next project harder. If you’re ever unsure about a digging project or which tools to use, talk with us today!